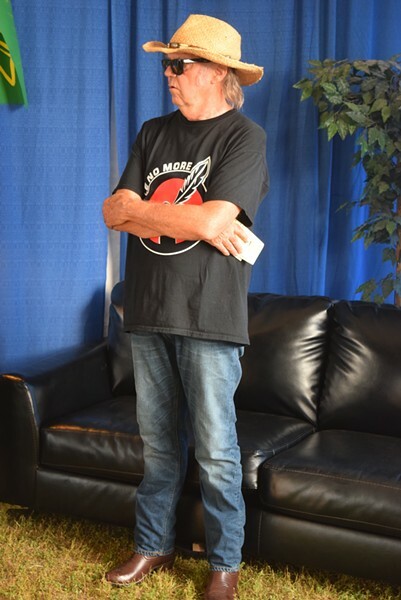 Neil Young pledges $100,000 Sunday to Gov. Peter Shumlin toward Vermont's legal battle over the state's GMO labeling law. A few hours before Neil Young sang a note Sunday night in Essex Junction, he put his money where his mouth was about to go. The rock legend pledged $100,000 toward Vermont’s legal bills to defend the state’s GMO labeling law. "I'm just a rock 'n' roller who believes people should know what they're eating," Young said at a backstage pre-show press conference with Gov. Peter Shumlin. Then he upped the ante. Young’s interest in Vermont’s law worked out pretty well for Shumlin, who got to watch Young’s sound check from backstage and planned to come back for the show. “He called me out of the blue about 10 days ago and said, ‘I’m coming to Vermont. 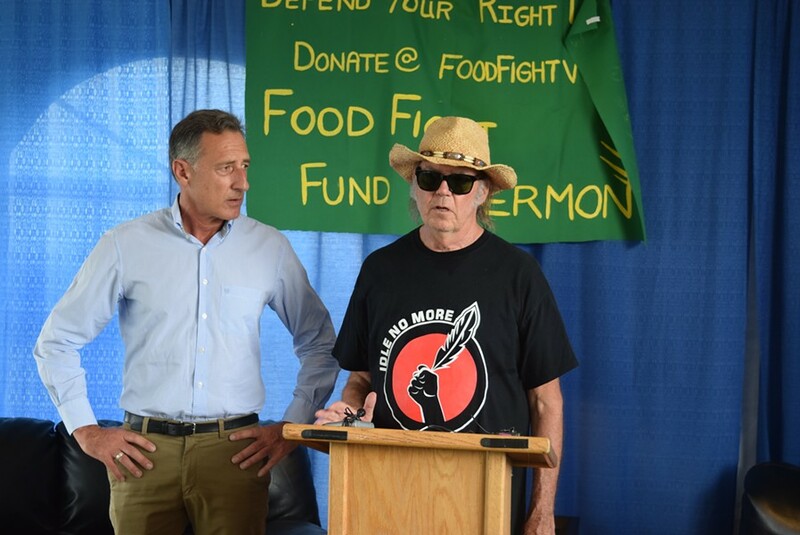 I want to help you raise money for the Vermont food fight,’” Shumlin said at the press conference. Young's call might have been unexpected, but several supporters of GMO labeling said they and the Shumlin administration had been actively trying to work out some sort of connection with Young while he was in Vermont for Sunday’s sold-out show at the Champlain Valley fairgrounds. Sen. David Zuckerman (P/D-Chittenden) and Falko Schilling of Vermont Public Interest Group, who were both active in passing the GMO law, attended the press conference. Young’s money is a big boost to the $450,000 Vermont had collected already in donations to help with what could be a multimillion-dollar court battle. The state’s law seeks to require labeling of foods that contain genetically modified organisms, starting next July. The Grocery Manufacturers Association, which represents some of the largest food producers, has sued the state, arguing there’s no fundamental difference between foods with or without GMOs. Young sought to refute that argument. He brought to the news conference scientist Shiva Ayyadurai to talk about his research on GMOs. Ayyadurai said the results call into question the notion that GMOs are equivalent to conventional counterparts. Young, who took no questions at the news conference, also never mentioned his other recent Vermont political interest: presidential candidate Bernie Sanders. Young last month threw his support behind Sanders and gave him permission to use Young’s classic song “Rockin’ in the Free World” after Republican presidential candidate Donald Trump used it without permission. Sanders was campaigning in Texas on Sunday. On stage Sunday night, Young never sang “Rockin’ in the Free World.” But the 69-year-old played non-stop for nearly two and a half hours, mostly delivering non-Monsanto Neil Young classics. He opened with show with “After the Gold Rush,” a song he wrote 45 years ago that seemed to still fit with the anti-Monsanto theme.